The boys were so excited to return home from a few days with my mom and dad. Not because they got to see me, because it had snowed & they just got new snow pants and snow jackets. The moment they walked into the door they were running upstairs & throwing on layer after layer. & then out the door they went. & then in they came to warm up. & then out they went again. It's like they had never seen snow before & it started to make me think about taking them to the mountains. To see REAL snow. Christmas is different than Thanksgiving for us in one way, we DON'T let it pass without spending time with both of our families. We wish we could ensure the same happens at Thanksgiving but we often have family from out of town in or we head out of town but Christmas, no excuses. So the day after Christmas we loaded up nice and early in the car and headed south down 49 to my mom and dads. We would have two Christmas celebrations, one at my parents' and then the Hartley one at my aunt and uncles. As soon as my sister and her kids arrived, Christmas began. The kids all took turns opening one gift at a time and after they each had opened a couple it was a free for all. I snuck off while all the madness was happening and snapped this picture from above. To some it might look like chaos, to me, it's my happy place. Mom and Dad bought all the grand kids World Series Champion shirts and wanted to get a picture with everyone wearing them---it took some convincing on Maddie's part but they finally all smiled. For the rest of the afternoon we played cards, did Legos, and ate. A lot. And then it was time to get ready for the Hartley Christmas & my niece and nephews wanted to take a picture with me as they thought it was funny they were almost all taller than me...next year they will be. 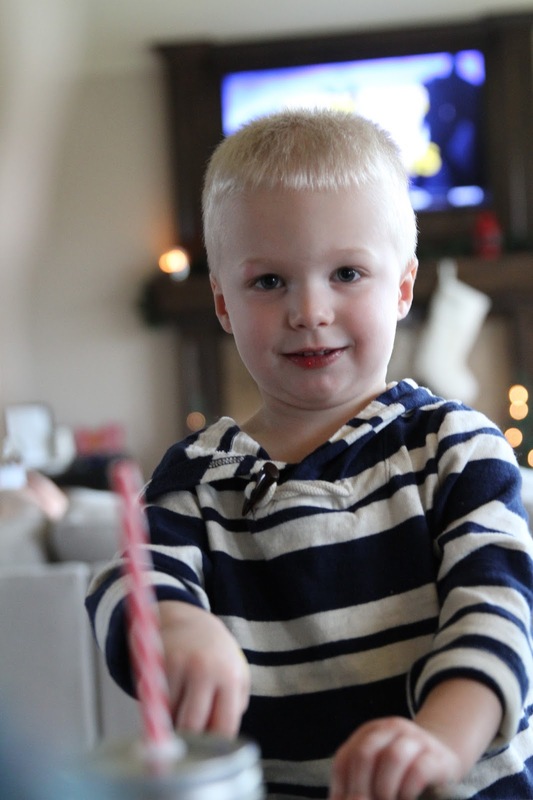 Logan in his grandpa sweater just melts my heart in every way. This year we had a few more people at Scott and Kelly's to celebrate Christmas with, my cousins Stephanie and her husband were fostering two adorable children and my cousin Brad and his partner were helping raise their niece and nephew for awhile, not too mention a new cousin was about to be born at any moment---we didn't realize that at the time though. The house was full & so was my heart. These are the moments that I wish I could just hold onto a little more. To be surrounded by those we love and those that love us. There really isn't anything better. Just about the time the boys are ready to open all their new gifts and play with them the South Christmas starts and they must put everything to the side for a little while longer. Typically the kids will go first, followed by Janet and then Justin, Adam, Becky and I will open in unison as there is a pretty good chance what I am opening, Becky is too. My MIL is probably the fairest person I know. One of the things that I cherish the most, their yearly ornaments that Janet gets each of them. I love how she picks out a special day from the year and includes it in their ornament, makes putting them on the tree year after year so much more special. 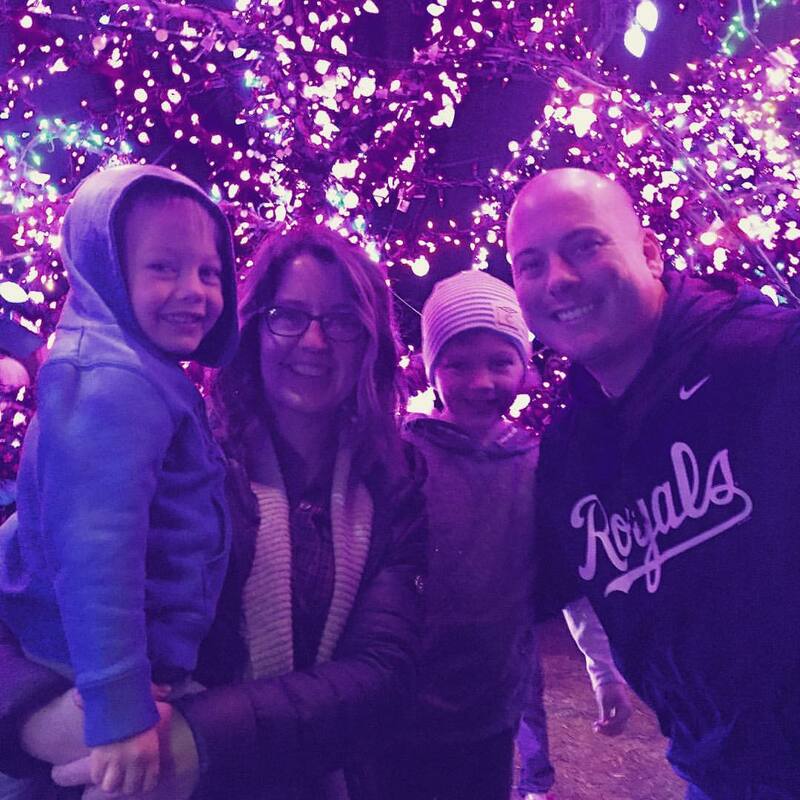 This year she chose pics from the 2015 World Series Ticker Tape Parade---Forever Royal. 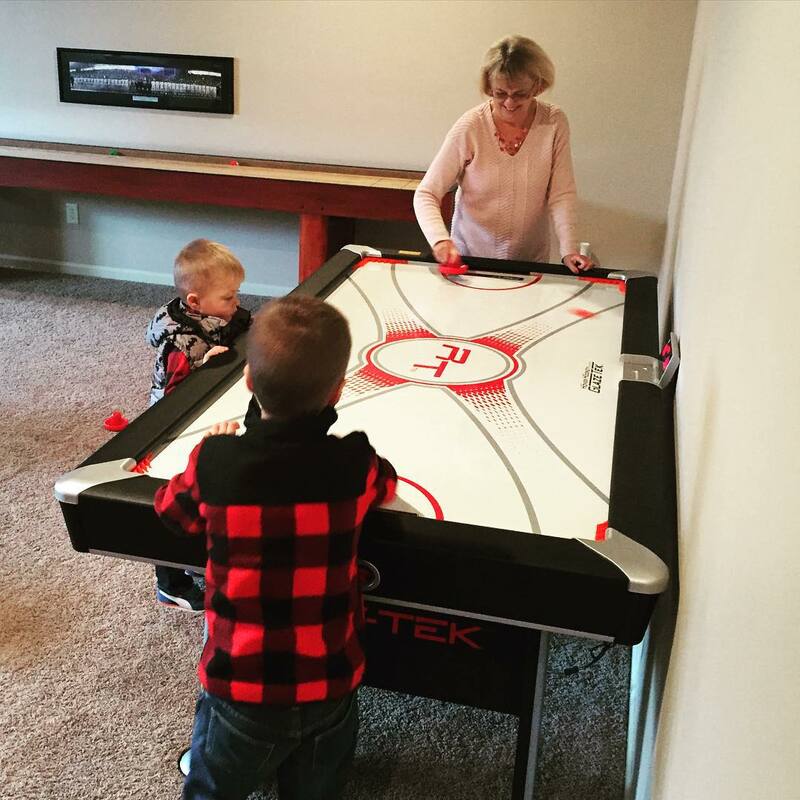 Once the gifts were open the boys had time to play with a few of their new toys and to try out the hockey table with Cousin Colton. Our South celebrating wasn't over yet though, we had been invited to Justin's cousins house for dinner and more family time & since both the boys were wearing plaid, Justin decided to join the fun too. The weather was gorgeous, so much so, that our little boys were playing football with Justin's cousins big boys. Justin's aunt and uncle came in from Florida which we don't get to see nearly enough and brought with them old videos from 40+ years ago. It was so fun sitting there and hearing all the stories being told & seeing my MIL as a little girl too. 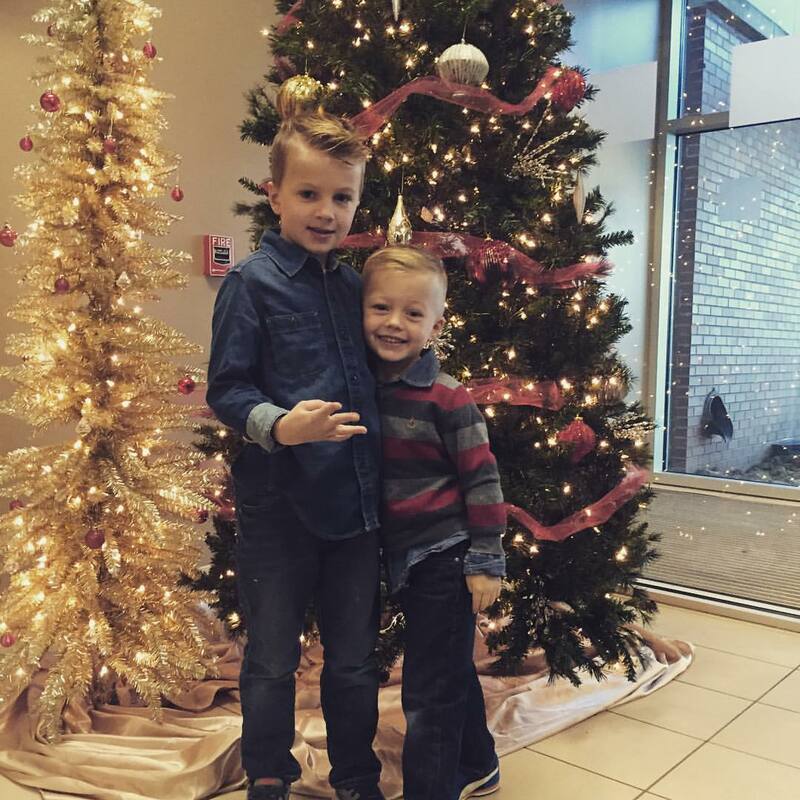 Kaden and Logan weren't sure what to think but they seemed to enjoy it just as much as anyone else. 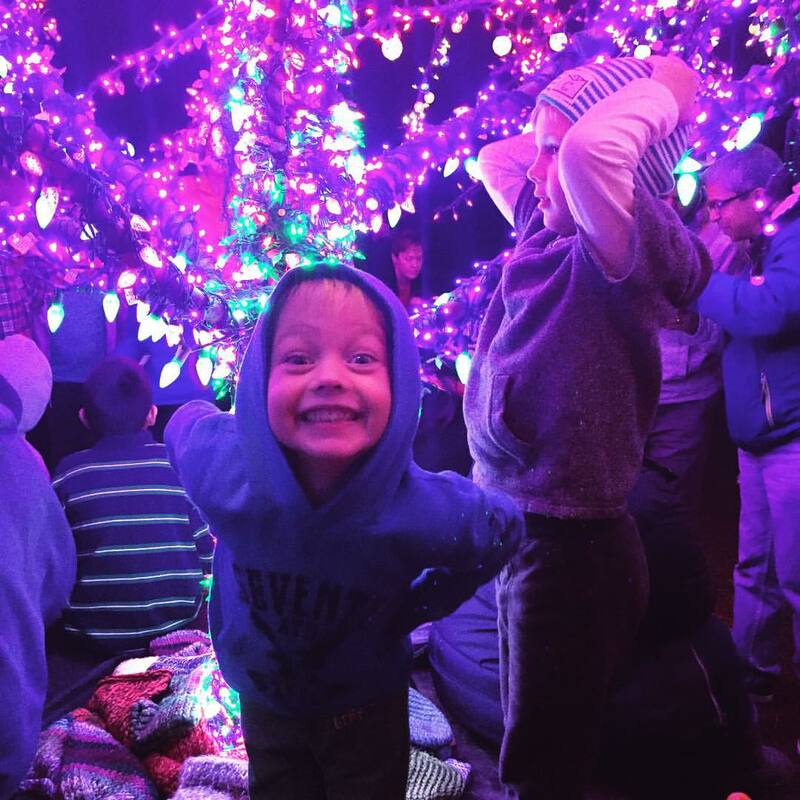 It started to get late & the boys were starting to get tired from their super long day so we loaded up and headed back home but we managed to talk Justin into one last stop---the Magic Tree. Again. 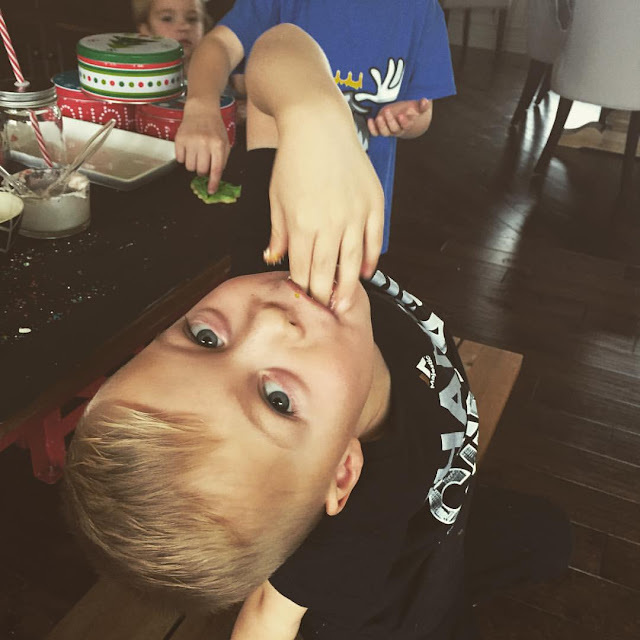 Christmas Day was everything. It always is. I swear, Christmas just keeps getting better. The magic was through the roof at the South house this holiday season and not just because of the obvious reason but because we really tried focusing on the real meaning of Christmas and spreading joy and love to those around us. 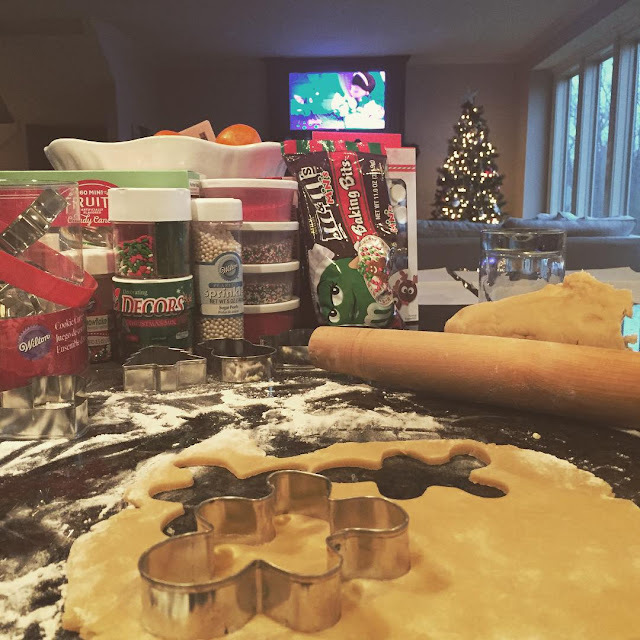 Our Christmas festivities started off with a little holiday baking, this was our 3rd annual South Holiday Baking Extravaganza & before we knew it, we were done. Which only meant we needed to deliver our baked goods to our neighbors and get ready for Christmas Eve Service at our church. Logan had recently come down with pink eye so he stayed with Justin and I while Kaden ventured on to his class. They clean up pretty nicely. We decided to head out to dinner for Christmas Eve and went to one of our favorite places but they were slammed so we figured we might find something else---NOPE. Everything was either slammed or had closed down early so it was back home and we loaded up on cereal but the boys, they didn't care they were bursting at the seems with excitement. After dinner they ran straight up stairs to put on their PJs that Fishlegs had left them. 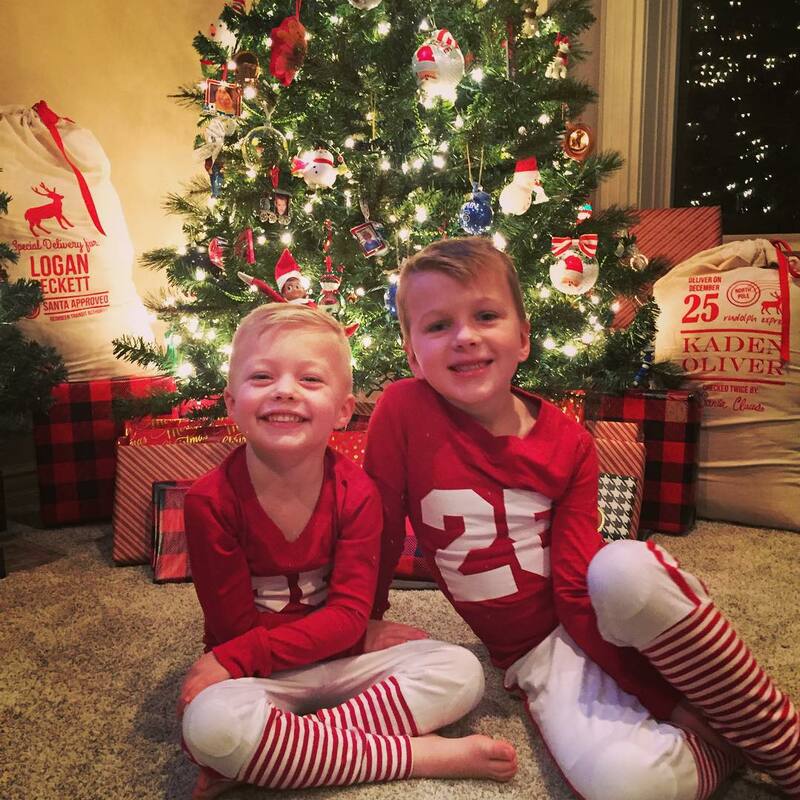 I bribed them for a few more pictures of them in their Christmas PJs and then we settled in for some hot cocoa and a movie. Before heading up to bed they got to give Fishlegs a farewell hug and although they were sad to see Fishlegs leave, they knew it also meant that Christmas would be here when they woke up. 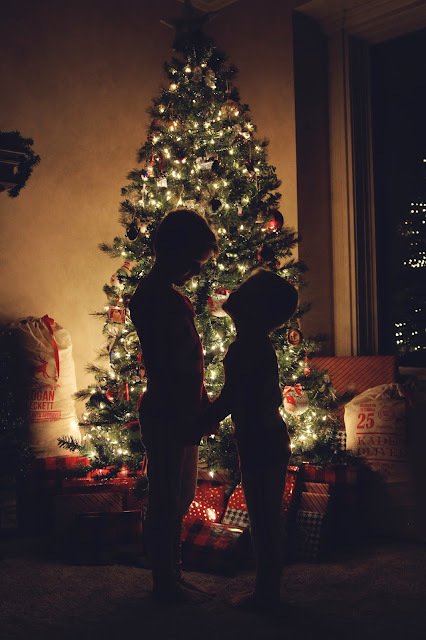 And as I was tucking them into bed I could hear Logan telling Kaden not to forget to wake him up and when I asked what they needed to wake up for, Kaden replied with, "we are going to try and see Santa!" This was the first year that they had expressed any interest in catching the jolly old guy & instantly put a smile on my face. 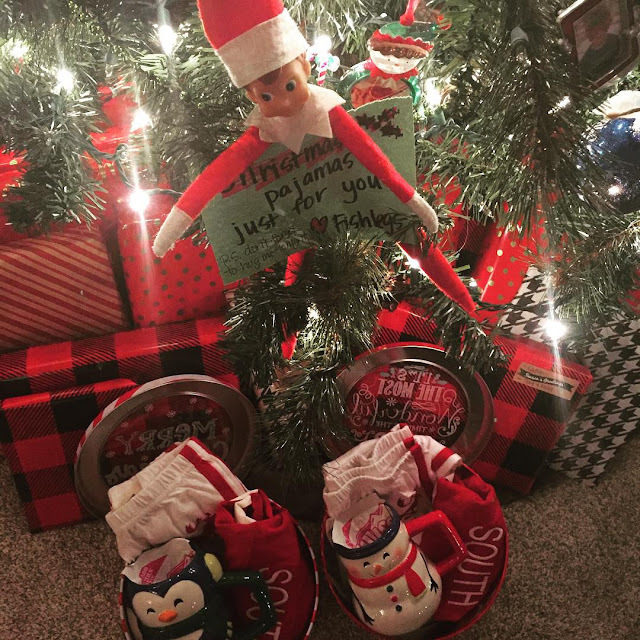 And while the boys slept, Santa came down our chimney and was quiet as a mouse while he filled the boys stockings and left them a big surprise. I didn't sleep a wink, there was too much excitement, the boys, slept like logs. I was starting to think I was going to have to wake them up but finally they came in about 7:30 ready to run downstairs. and of course I had my camera ready to record. 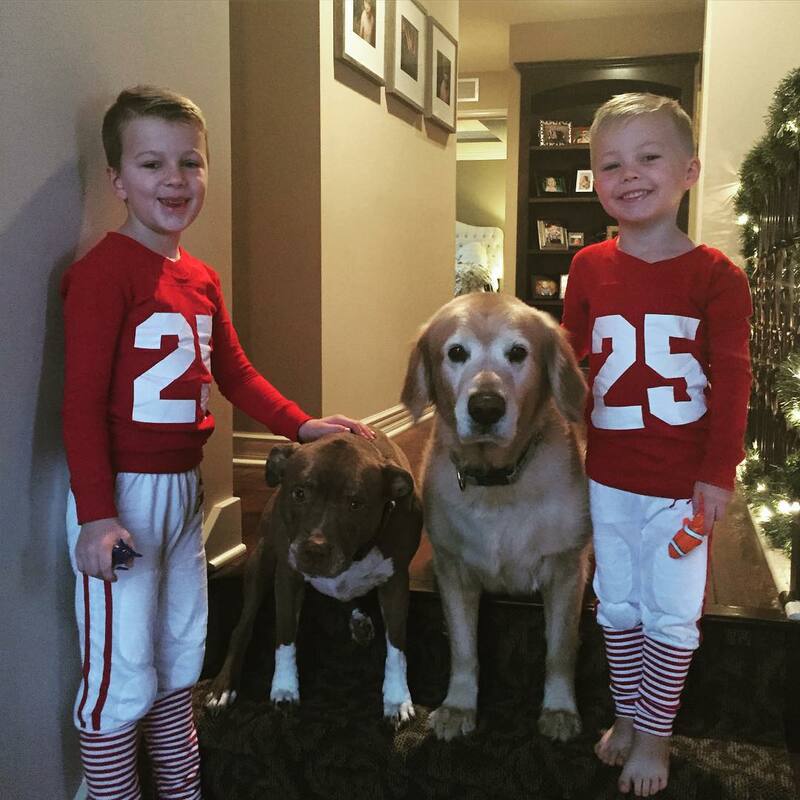 Needless to say, Santa's gift was a big hit and they spent their fair share of time playing together on it. Even Grammy got in on the action when she arrived at house. After the boys had opened up their stockings from Santa we moved onto our gifts to them. Our THREE gifts to them, Baby Jesus was presented with three gifts and if three gifts were enough for our Savior, three gifts are plenty for the boys. A want, a need--usually an outfit, and a read. Kaden received a new game for their 3DS, an outfit and a Stuffies that came with a book. 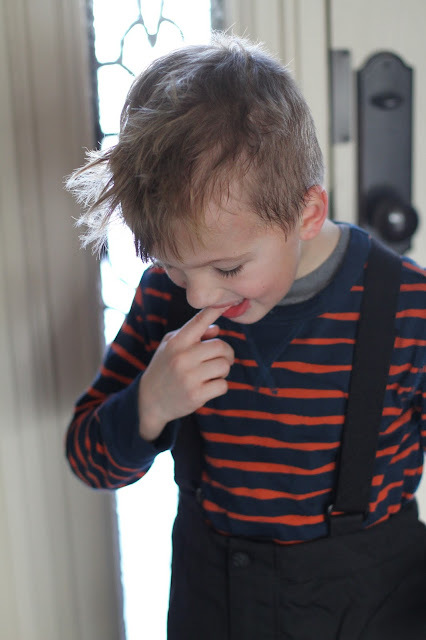 Logan received a new game for their 3DS, an outfit---an old grandpa sweater that zips, the kid loves zipping sweaters, and a Stuffies which also came with a book. It wasn't much but they didn't care, they were thankful for what they did get and proclaimed multiple times, "This is what I have always wanted!" We were blessed beyond words and looking at them I couldn't help but be reminded of how great our God is. 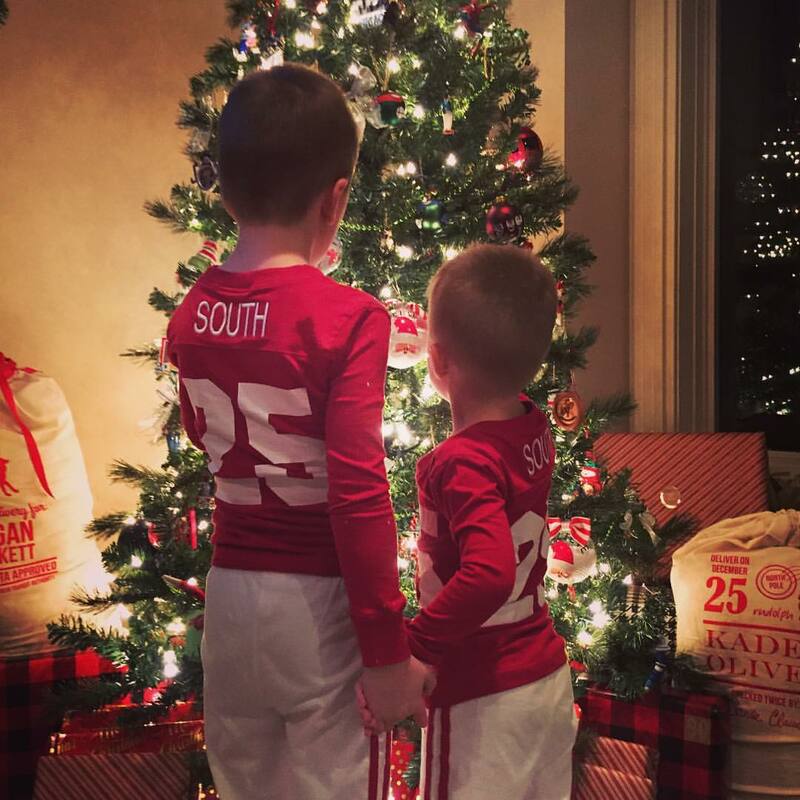 Sending love and best wishes for the merriest of Christmastimes & happiest of new years from our family to yours. May we all open our hearts a little more to one another with love and compassion in this new year. 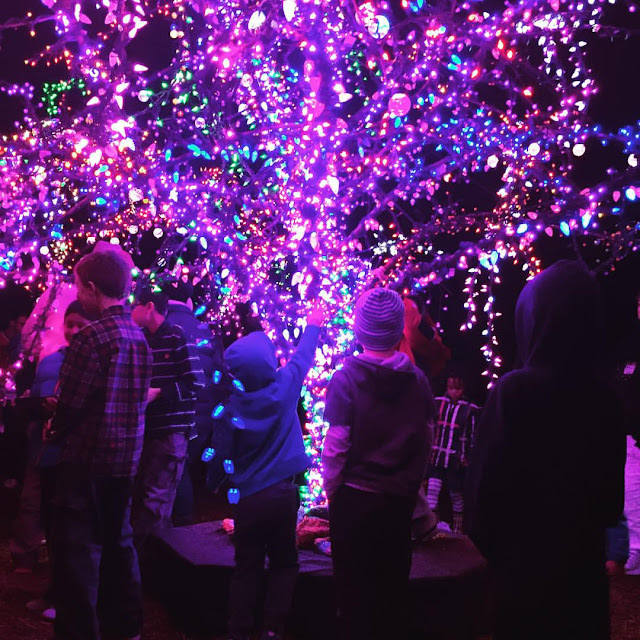 Over the last few holidays I had heard about the Magic Tree but never really looked into finding it or gave it too much thought because last year was our year to check out Deanna Rose & the boys were happy with that. We googled it and found the location and headed east. And. It. Was. Magical. The boys were in awe. And so was I. It's just this beautiful tree in the middle of a field full of lights, I can see where it gets it's name. & we will certainly be adding this to our list of must-sees during the holidays each year. Before kids we use to have all our friends over for a nice dinner and then a night of games. 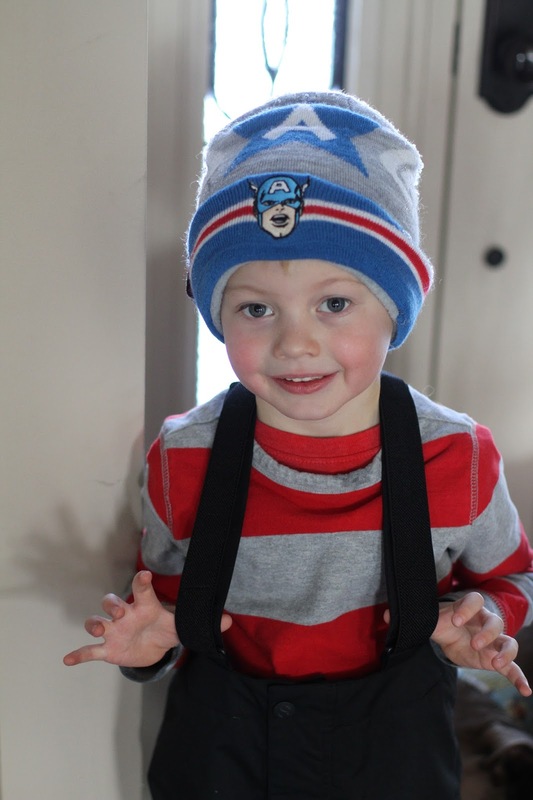 Then Kaden happened and it just didn't feel the same so we changed it up. We still got together but instead of the party occurring at night, it occurred during the day. & as the kids grew older, it morphed again, into decorating gingerbread houses and cookie decorating parties. 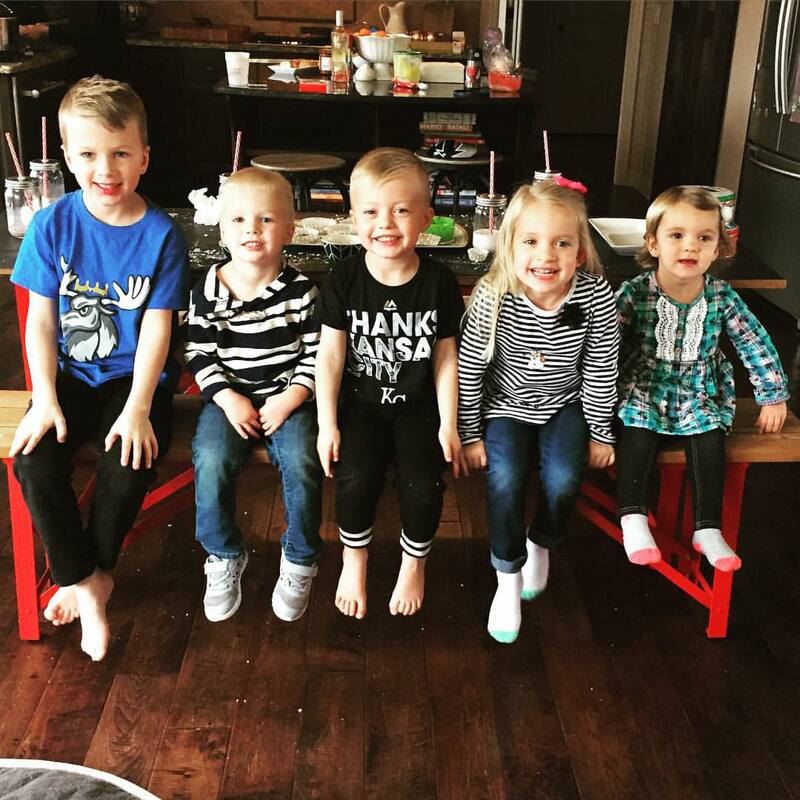 I always look forward to seeing all the kids together and with it being the holidays it makes it that much better. So we planned our 3rd Annual Kids Party & we picked a date--12/12/15. 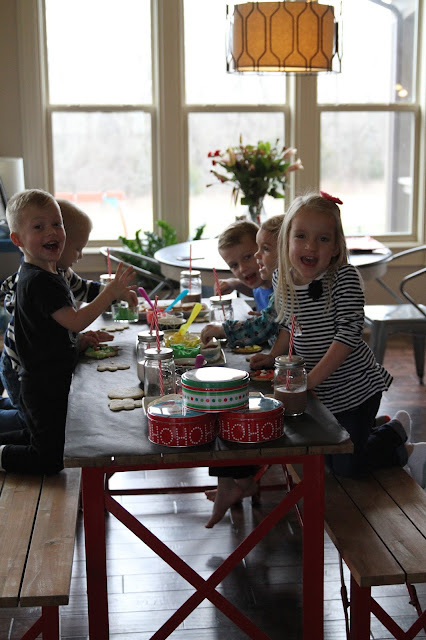 & since we were already having our friends over on Saturday, why not add another cookie party to the calendar and invite my dear co-workers and their kiddos---they are all about the same age and love playing together too. So that's what we, well I, did. I ran it by Justin, he said sure and we sent out the invites. & then our neighbors invited us over to their house on the 11th for their annual cookie party. 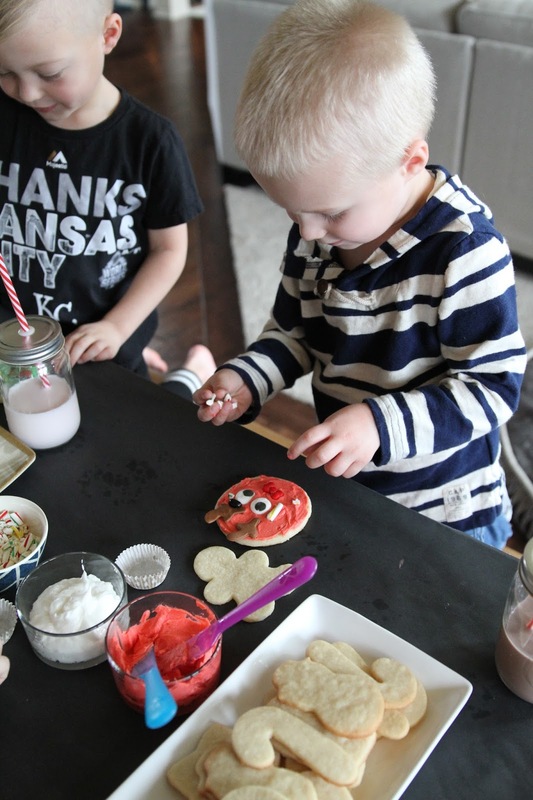 3 cookies parties in three day---thankfully, I only had to plan one and replicate it the following day. And even though we were only headed next door, like literally next door, we still needed a sitter so we dialed one up and both took a drink to go. Talk about conveniently located. 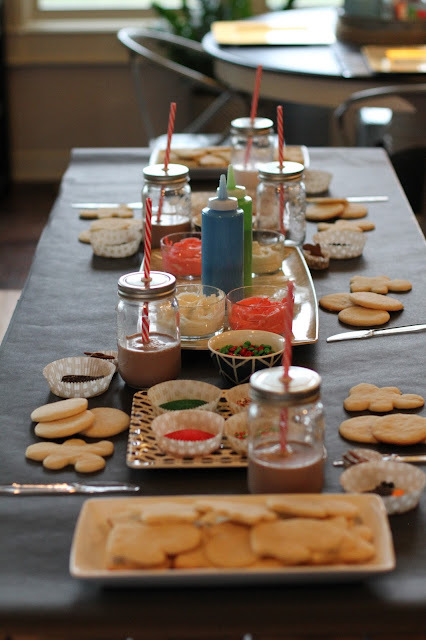 This first party was an adult only cookie party & each couple received a their own apron for the event. 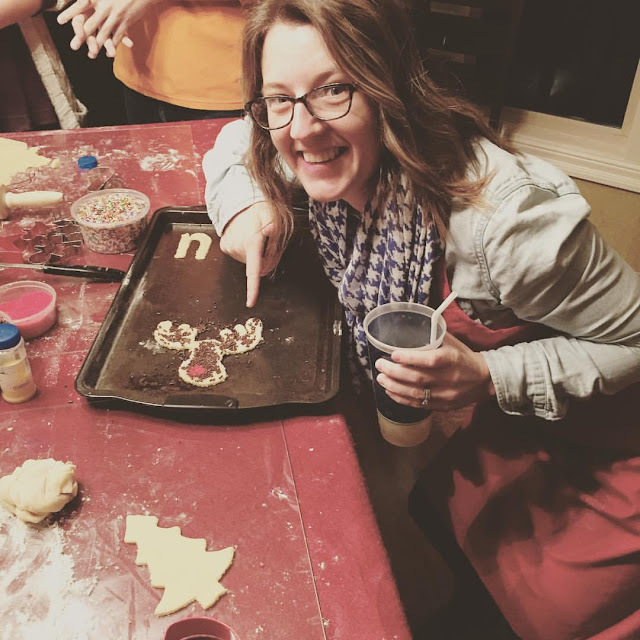 We all had to roll out our dough and decorate a few cookies---I decided to go against the norm and went the freehand route with my Red-Nosed Moose. We were also introduced to Fireball and iced shot glasses, followed by a game of Left, Center, Right to which I almost won. So close. 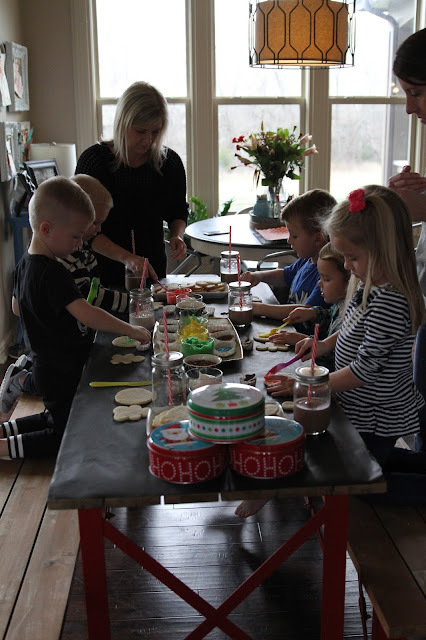 We said our good-byes around eleven fulling knowing we had a busy morning to get ready for our afternoon cookie party and as soon as I was awake I was in the kitchen baking cookies. 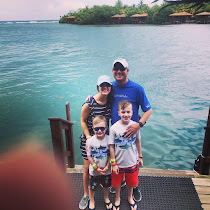 We didn't have as many kids as we did last year---it's the holidays and everyone is busy---but we still managed to have fun. 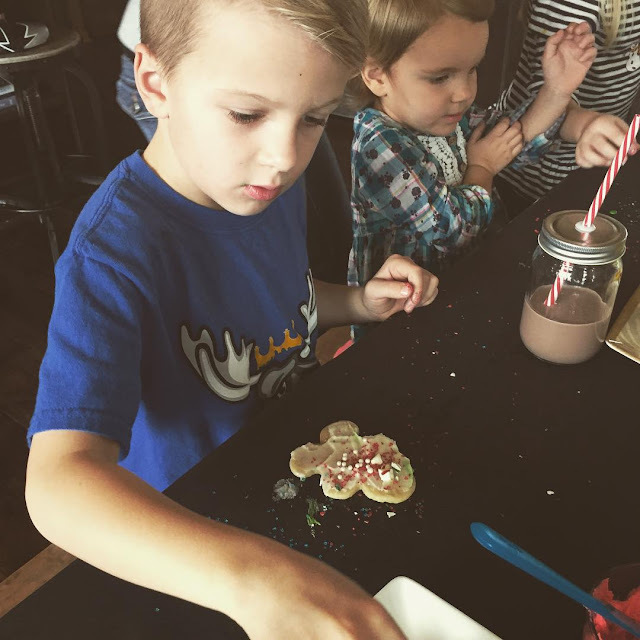 Pretty sure each of the kids had more fun eating the sprinkles and licking the icing. Then again, isn't that how it should be. 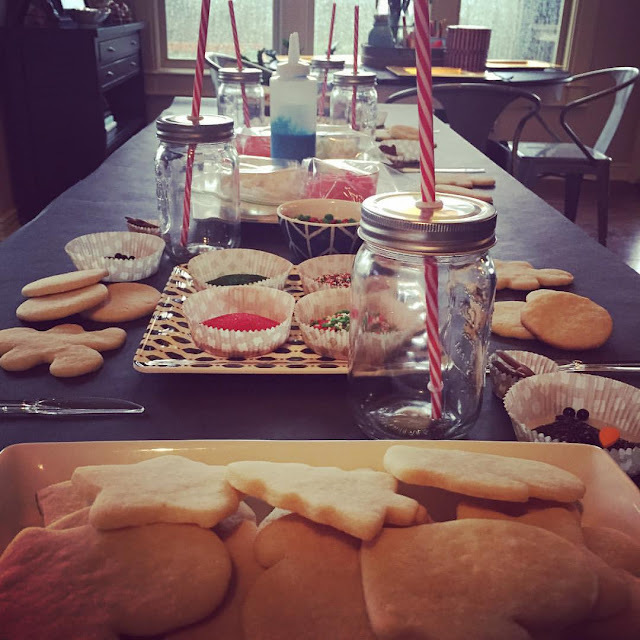 And before we knew it we had gone through over 40 cookies and a truckload of sprinkles. They range in age from 6 to 2 1/2 and yet they all have so much fun with one another. Kaden use to see Sophie and Lilly almost every day when he was at Brenda's but now since he is at school he doesn't see them as often and you can always tell how much they have missed each other from the size of their hugs. It warms my heart. We had two parties down and one more to go so there was no time to slow down. Instead of waking up on Sunday morning to bake more cookies I decided to go ahead and bake them the night before. All that was left to do was make some icing & I wasn't all that happy with my first batch so I made a second which seemed to be a little more kid friendly & now we had two options---trial and error. 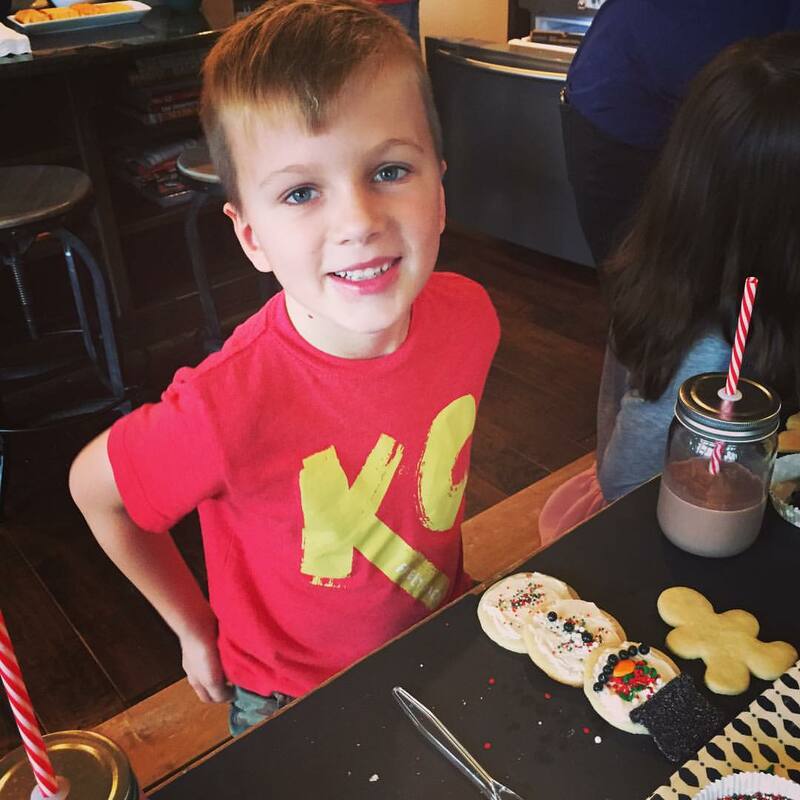 We loaded the table with icing, sprinkles, cookies, chocolate milk and little reindeer and snowmen kits & we wait for our guests to arrive. 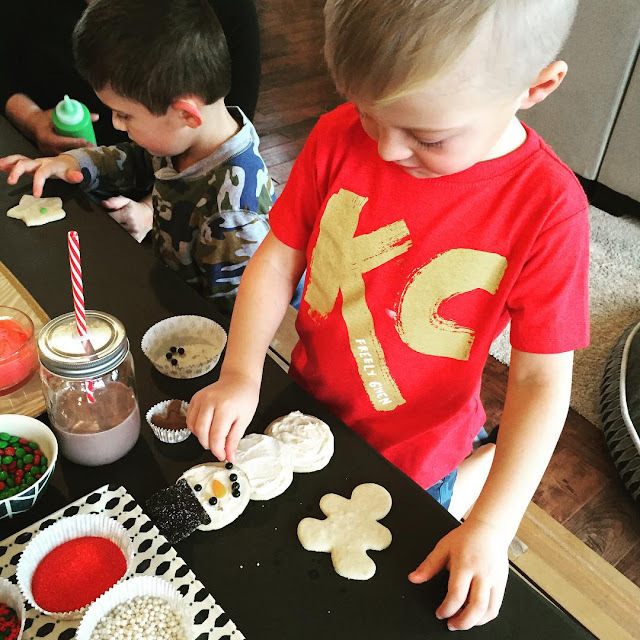 It took no time for the kiddos to dive in and my boys weren't the only ones who became pros at cookie decorating---each of the kiddos had recently been to other cookie parties & they did not want help when it came to the sprinkles and decorations. 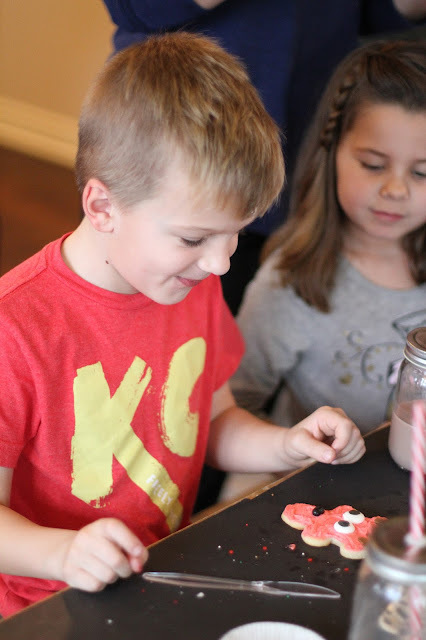 & once again, it took no time at all for the kids to go through 40+ cookies---next year, I may have to make a double batch or we may do gingerbread houses again! The best thing about this party, Kaden and Logan made some new friends. I see my co-workers pretty much everyday but we hardly get to see each other's significant others and their kiddos and if we do, months go by before it happens again so this kiddo cookie party was perfect for introducing them to a few new friends. New friends that they haven't stopped talking about since.